Why You Should Choose This Shere Wood Cabin for Your Home & Family. Many log cabins tick different type of boxes each suited to different needs for today’s life. However, this Shere log cabin pavilion with its full width 1.5m deep veranda is a delightful building and won’t look out of place in any location. The clever design of this building means there are two models. Model 1 is under 2.5m tall so that be built next to a boundary, whereas model 2 has a taller pitch which enhances its appearance. Both models of log cabins will support all sort of socialising with your family, friends or colleagues. And with a little imagination, you should be able to visualise what this building can do for you. A delightful looking and functional building for your garden and home. Utilising Nordic slow growing timber ensures that this building is built for the long term. In cold countries, such as Sweden, this type of timber is used as standard due to its great properties to withstand the worse weather over there. Not content to be using Nordic timber the design using very thick logs as standard which makes this a VERY strong building indeed. (There may be a 44mm option available soon). Also built into the design is strengthening bars and this further enhances this great log cabin. With its appearance, strength and looks it should be considered as an option for your garden. The timber used throughout is top notch, as are the double glazed doors and windows. No expense is spared in ensuring these log cabins will fulfil their roles with ease. With everything designed for our great British weather as standard. 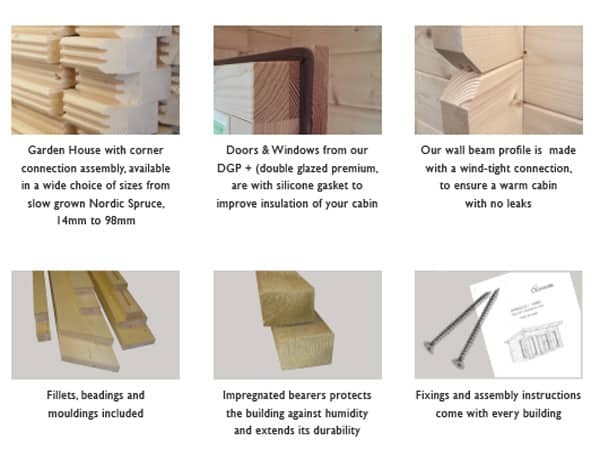 You won’t find any chipboard, OSB board or other cheap sheet materials in these cabins as these buildings are made to a standard and not ‘down to a price’, unlike many cheap log cabin makers. So when looking pay particular attention to the specifications to ensure you get the best. By buying a CHEAP log cabin might save you money but in the long run, what you need is the best value building and that is one which will last. Naturally, all timber is kiln dried and comes from renewable sources. The design of these cabins are very logical and a good DIY’er should be able to build one without too much trouble. However, they are a little more involved than a four side cabin so it’s never a bad idea to call in the experts. We do have recommended third-party installers who can assemble these buildings for you. By taking this course of action you can be sure the building will be erected correctly and all you need to do is to work how to enjoy the building with your family and friends. And that has good to be a good thing. Well worth considering? The web is a great tool for locating log cabins for sale but it can never demonstrate the quality of the product being offered. This is why, if possible, you should always make it a prime consideration before buying or viewing cabins beforehand. 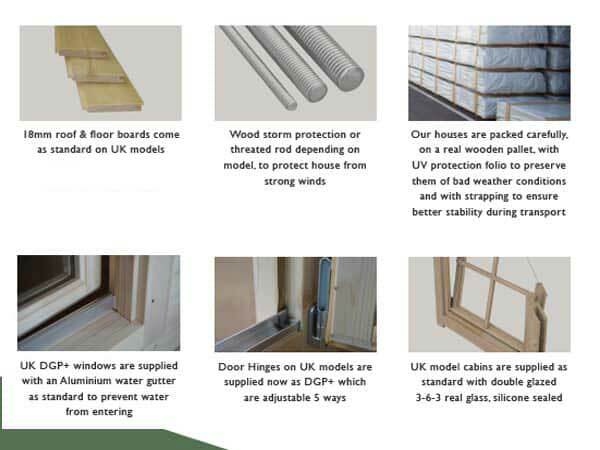 Even if you are unable to view, dealing with a company which has a log cabins UK display site, should give you more confidence in their products. If they are happy for their products to be inspected at close quarter – unlike many garden cabins firms selling on the web – then that has to be a good thing. If you can visit a log cabin site you can make your own mind up about the quality of the building so that you know when it arrives you won’t feel let down or feel misled. So take a look on our display site and see how good these buildings are. Size: Overall size is 5.4m x 5.2m (18ft x 17¼ft approx). Body of log cabin is approx 5.4m x 3.7m (18ft x 13¼ft approx) veranda area is 5.4m x 1.5m (18ft x 5ft). All sizes nominal. Apex or gable Log Cabins Style. Note this is the external size of the body of the cabin. The lugs extend 100mm on each corner making the overall size (as most other companies quote) 200m larger. We mention this so you know you are comparing ‘eggs with eggs’. Approximate clear internal size will be approx 5.1m x 3.6m. Please check with us if internal size is crucial. Cladding: Standard timber logs are substantial 70mm thick (nearly 3 inches thick) they interlock into each other and are cut from a top grade of Nordic timber, kiln dried timber from sustainable sources, to ensure the maximum stability and longevity of the timber. The log profile has designed wind-tight connections to ensure a superior resistance against wind. Untreated. 44mm option coming soon. Roofs: 18mm thick T&G boards used on the roof sections supported by strong roof beams. Roof beams meet EN 388 stringent standards. Untreated. Supplied with shingle (felt tiles) in either black, red, brown or green or Polyester based felt as standard. 300mm (approx 4in) overhang all round. Balcony : The covered enclosed balcony extends over the main doors providing shade and shelter for the cabin. This log cabin balcony is full width and approx 1.5m deep. Floors: Extra thick 28mm T&G untreated boards used on these log cabin floors. No nasties such as chipboard, OSB or other cheap sheet materials used on the floor, unlike some other log cabin suppliers. Floor joists are 70x45mm and are normally spaced no more than 650mm apart. All floor joists are pressure treated for long life as standard. Doors: Double joinery doors. Size of log cabin doors is 158cm x 200cm (62in x 78in). Supplied untreated. ¾ height with double glazed toughened glass. Beware of doors with single glazing or excessively high door sills. Windows: Two (2) ¾ length joinery quality inward opening windows are included as standard. Size of each window is 1200mm wide x 1320mm high (47in x 52in). Complete with easy adjust hinges, silicon gasket seals and delightful silver finish window handles. Supplied untreated as standard. Double glazed with toughened glass as standard NOT single glazed. Lower Walls: Height: 2180mm (85½in) – all Shere log cabins. Installation: Log cabins are supplied in kit form for self build. Option for fitting through a third party if required. 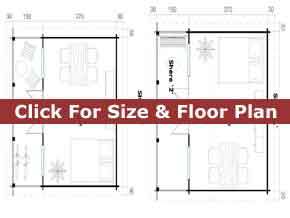 If being built you would require a concrete base or solid and level paving slab base. Optionally, we have an option for building a base for you in some areas. These log cabins are assembled by interlocking the panels for ease of taking it down again if you decide to move. These amazing Trentan ‘Shere’ wooden cabins for sale with its full width 1.5m deep veranda will make a big statement in your garden. It will also be a great feature which you can enjoy sharing with all your family and friends. The ¾ length glass doors are double glazed for comfort and for safety. 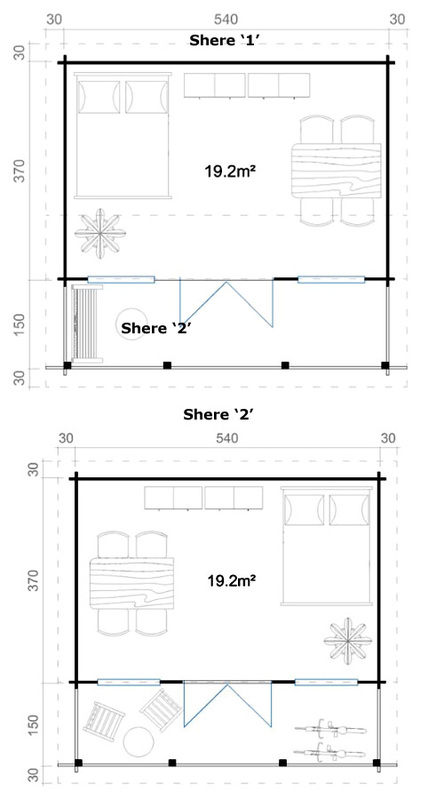 There are two models with model 1 being planning friendly being under 2.5m tall. Before spending your money, ideally, you should try to see examples of log cabins beforehand. We have a display area near Guildford in Surrey where you can see examples of the Trentan range for your self. Don’t risk wasting your money and end up sorry.